Joshua Lenon is the “Attorney-in-Residence” at Clio, one of the leading cloud-based legal practice management platforms. As a practicing attorney, fresh out of law school, Joshua was frustrated by how unprepared he felt for the practice of law. As he described it, everything was four times harder than it needed to be. Joining Clio has given him the opportunity to help address that problem. As the only practicing attorney working for Clio, Joshua is in a unique position to provide advice, assistance, and troubleshooting for all different areas of Clio’s business. Apart from translating legal needs into “tech speak,” he acts as the educational lead for outreach programs like the Legal Hacking movement. Do you need to come up with clever solutions? Are you required to personally help others? Does your job require you to squeeze into small spaces? Does your job require negotiation? Why Are Lawyers Less Vulnerable to Robots? 1) Lawyers are required to apply unique facts to the law. It’s the traditional law school issue-spotting test: Take a particular fact pattern, and apply it to the law you know. The thing is, issue spotting, at least at the moment, isn’t always as direct as it seems. Being able to intuitively parse through a client’s story and position, relying on your experience in practice, to determine what the important facts are, is critical. 2) The law remains highly geographically local. We live in a federal system that relies on common law. That necessarily means that our system of government is based on trusting different parts of governing to different levels of government. The federal government gets security, trade, immigration. The state governments get (most) criminal and family law issues. Cities and counties get to determine most issues of zoning. Moreover, our common law system means it’s up to the local judge to determine, in many cases, what the law is for various circumstances. 3) The law is a tangled mess. As Joshua puts it, the term “legal system” is a bit of a misnomer – it’s not really a system that’s designed to be easily navigated. Especially the same way, over and over, the hallmark of any automated process. Additionally, a lot of the processes we do use are typically the result of historical practice, and lacks consistency from jurisdiction to jurisdiction. What makes lawyers different from judges? While it’s always important for the lawyer to know the judge, Joshua pointed out that the same doesn’t necessarily apply in reverse. Judges don’t necessarily have to be local to do their job – in fact “riding a circuit” has been the hallmark of American jurisprudence since our founding. So, instead of traveling a long distance, judges can “appear” and adjudicate matters remotely. How can lawyers remain free from the robots? Essential to lawyers remaining difficult to replace isn’t one particular tool or technology, but maintaining the right mindset. There are a few essential ideas that a lawyer needs to maintain in order to keep that percentage low. First, we need to remember that there is no one tool that solves all of our problems. None of the tools created (admitted Mr. Lenon) are capable of addressing the needs of all types of attorneys. Even if such a tool were created, the nature of technology and the law dictates that there will soon be even better tools. Don’t seek the one perfect tool, but rather find the right tools that provide the best assistance now. Second, make sure to keep your ethical obligations in check, particularly as you convert your files from paper to digital. As you adopt new legal tools, make sure that you have an exit strategy for your documents. Make sure that all your files can be converted to a current, usable type of document. A good place to ensure this happens is in your cloud provider’s terms of service. Finally, look to adding value to your clients in ways that decreases their legal costs. Face it, litigation is only fun for the lawyers (if even for them). New tools, such as contract analysis tools, can help predict potential legal problems. Being able to alert your clients to potential issues, preempting litigation or at least preparing them for it, benefits both you and your clients. 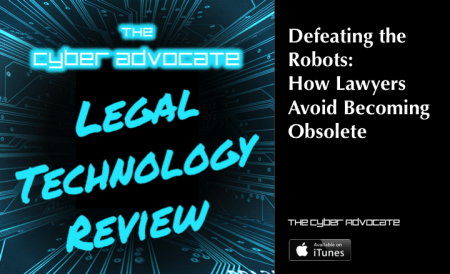 If you’re enjoying the Legal Technology Review Podcast, please head over to iTunes and leave a rating and review!